This article was written on 23 Aug 2016, and is filled under Author: dew. Trish Gable (Krysten Day) is a latter-day Marcia Brady with a trashmouth hidden beneath her saccharine exterior and an apparent need to work her way through the entire football team at her school. Sadly for Trish, her beaus are getting knocked off one by one by deranged killer, all the while she squabbles with siblings Laura, Bobby, and BJ over soon to come inheritance from her ailing father. On the other side of town, the Manly family contends with a comatose matriarch and a newly returned delinquent brother, all the while sister Chanel finds herself competing against pretty blonde Trish for everything she wants out of life. If you ever wanted to see every stereotypical teen from your graduating class get knocked off one by own in inventive and often overtly sexual ways, this is the film for you. Any fan of soap operas or teen drama will be amused by the cliches and tropes turned on their ear, from doppelgangers and existential angst to sibling rivalry gone mad and mid-series actor replacements. It’s fun, it’s funny, and it doesn’t take itself too seriously, which is just the sort of refreshing content the horror genre needs these days. The film is presented in three segments, purportedly the recently “dug up” prints of a long forgotten television series, and presented by Debbie Rochon, acting as a horror host the likes of Fright Night‘s Peter Vincent with a slightly more sinister bend. Anyone who grew up waiting for late night weekend horror hosts to present their favorite edited-for-television schlock films will adore Rochon in her role introducing each film segment. While the format is inventive, it certainly has its flaws; the repetition of opening credits, as well as the insertion of commercial breaks advertising future Rochon films, cuts film time down as badly as a tv drama viewed on streaming media. 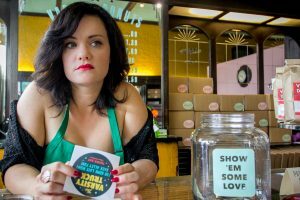 An inserted commercial for Debbie Rochon’s signature coffee blend (available online through Coffee Shop of Horrors – and seriously, where has this site been all my life?) takes a little too light of a jab at domestic violence that makes even the fun of a slasher-soap send-up dim a little in comparison. That being said, the length to which filmmakers took their trope is admirable, its quirkiness reminiscent of another favorite here, LoveCracked. The film is well-acted (we think) by a cast hamming it up for the screen in all the ways you’d expect, overacting where necessary and pausing to react in the same manner as a confused audience member when the madness amps it up past 11. Of particular note are Amanda Deibert as Chanel Manly, Ben Windholz as Butch Manly, and Blake Cordell as young Bobby Gable, arguably the least despicable character in town. Won’t you join us in HELL TOWN? We think you’ll enjoy your visit. 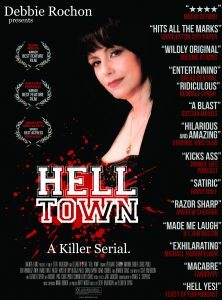 HELL TOWN will be available to rent or own on Tuesday, August 23rd via Dish Network, Cox, Charter, Verizon Fios, iTunes, Amazon Instant, Google Play, Vudu and more from Gravitas Ventures. © 2016 bloody-mess.net. All Rights Reserved.